Into the framers! | NJNA is Blogging! Even though I have spent most of the last week at home, it has been productive as I have spent time stitching as I listened to audio books. 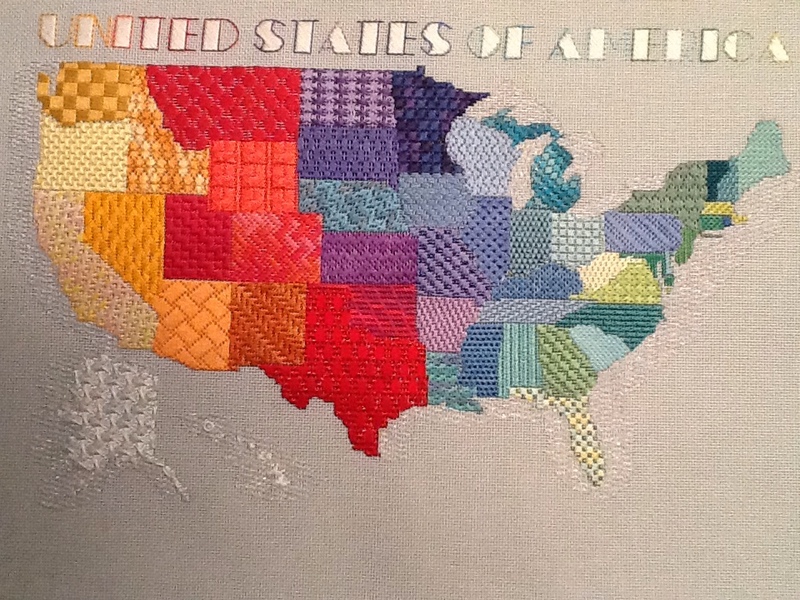 I was able to complete American Mosaic, a map of the United Stares. It is the class that both Heidi and I took in Chicago this past August. It was a piece I thoroughly enjoyed seeing come to life. Seeing Heidi's completed inspired me to get back to it. I also added a couple of rivers that were not on the original which had the Ohio and the Mississippi rivers. I added the Delaware River for New Jersey, my home state, and the Columbia River between Oregon and Washington for a few wonderful vacations spent out there. That is three completed seminar pieces and two to go! I love you added a river in the northwest. That may inspire me to add it before I take it to the framers. I added the Colorado River because my daughter and I did a mission trip in Tuba City and then went to the Grand Canyon. I will be giving this piece to my daughter’s son, so it seemed to be the right river to add. How was your spacing on the lettering, Sue? Love the finished piece.